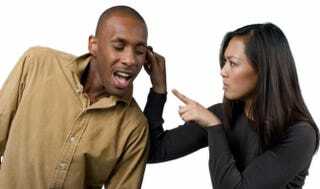 Maybe setting boundaries is a real issue in your relationship that needs to be addressed. But the example you’ve provided sounds less like you want boundaries and more like you want control. Let’s get some fundamentals out of the way. If you have a car and move in with a romantic partner with a license who does not have a car, your car becomes the house car. It’s now a shared vehicle. Your partner is going to use the house car to run errands and take it to go wherever else he or she wants. If you were not comfortable sharing all of your space and all of your things, then you should not have moved in with your man. Unless you’re planning to move out—and it doesn’t sound as if you are—you need to come to terms with the concept of sharing. And while you’re at it, ask him to pay half the car note, get insurance so he can drive legally and fill up the tank when he inevitably takes the car from time to time. Let’s also remember that your man is not your child, and he should be treated like an adult. Reminding him what you own and he doesn’t and what time he can come and go is what moms do. If you’re going to do that, he’s better off moving out and living with her. She probably won’t charge him rent. As of right now, he lives with you and he shouldn’t have a curfew, no matter whose car he’s driving or riding in. By your timeline, he took the car less than two hours ago to swing by his dad’s house. I’m challenged to understand what the issue is here. But I guess that 1:15 a.m. being “late” is subjective, even to hang out with a parent. (Tell me he’s out and about 3 a.m. and beyond and I may throw side eyes with you.) I know I can visit my parents and sit up with my mom until the middle of the night watching Hallmark movies and talking for hours about nothing. I don’t know the nature of his relationship with his father or who else stays in the house to even wonder if there’s something fishy about this. Does your man usually come back earlier? Are you worried that something happened to him or that he lied about where he went? Or are you just trying to control him? I keep mentioning control because of the way your question is set up. You wanted your boyfriend to do something with you and he declined. It happens. Your partner won’t always want to do what you want to do. It seems that you’re still in your feelings about him declining to go with you earlier and then being upset (I’ll get to that in a minute) that you were gone so long, and then him leaving the house and staying gone for what you consider a long time. Your concern about your car strikes me as wildly passive-aggressive in that he didn’t do what you wanted earlier in the day, so now you’re trying to pull rank over your car and keep him from doing what he wants to do. That’s not cool. It sounds less like you need to set boundaries and more like you need to stop being passive-aggressive. He might need to as well. Maybe he’s staying out later than usual because he’s mad that you were gone four hours. Or maybe he’s just hanging out with his dad and isn’t thinking about the time, which is reasonable. Instead of you flipping out about what time he comes and goes and who the car belongs to, I’d like the two of you to try to communicate your schedules so you can manage your expectations of each other. Both of these scenarios could easily have been avoided if each of you had just told the other where you were going and what time you should be expected back. Demetria Lucas D’Oyley is a contributing editor at The Root, a life coach and the author of Don’t Waste Your Pretty: The Go-to Guide for Making Smarter Decisions in Life & Love as well as A Belle in Brooklyn: The Go-to Girl for Advice on Living Your Best Single Life. She answers your dating and relationship questions on The Root each week. She is also a blogger at SeeSomeWorld.com, where she covers pop culture and travel. Follow her on Twitter and Instagram.